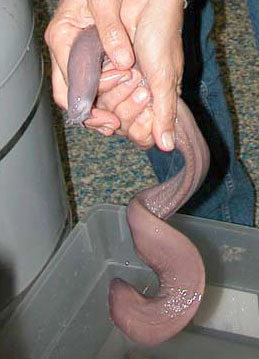 The Atlantic hagfish, scientifically known as Myxine glutinosa, is an unusual sea creature. Its body is covered with special glands that can emit a sticky slime. In fact, a single hagfish can produce enough slime at one time to fill a milk jug. This has earned it the name “slime eel”, although it is really not an eel at all. A hagfish will actually “sneeze” when its own nostrils fill with slime. Hagfish slime is different that any other natural slime secretion in that it is reinforced with tiny fibers. These fibers make the slime strong and difficult to remove. It is believed that the hagfish uses this slime to protect itself from predators. It can also be used to easily produce a protective cocoon for the hagfish. It is believed that this slime can actually suffocate predators by clogging their gills if they come in contact with it. The hagfish has a trick for escaping this slime cocoon. Believe it or not, this animal can tie itself in a knot and then pass the knot down the length of its body to wipe the slime away. The Atlantic hagfish has been called the nastiest and most disgusting little creature in the sea. Over 60 different species are known to science. There is actually some debate among researchers as to whether the hagfish is really a fish. It is more closely related to some primitive creatures such as the lampreys. Hagfish have a long, eel-like body that averages 18 inches (about a half meter) in length, although it is believed that some of them can grow as long as 32 inches (nearly a meter). The hagfish is a scaleless fish with soft skin and thick barbels on the end of its mouth. Hagfish have a partial skull but no vertebrae, so they cannot technically be classified as vertebrates. They have no jaws and no bones. Their skeleton is made up entirely of cartilage. They have very poorly developed eyes located just under the skin and are almost blind. They do, however have finely developed senses of smell and touch which help them find food in the darkness of the deep sea. There are four small sensing tentacles near their mouth. They also have between 5 and 15 pairs of gills. Their colors can range from pink to brown to various shades of gray. Hagfish have a very primitive circulatory system that contains four hearts. One heart, known as the brachial heart, serves as the main pump, while the other three hearts serve as accessory pumps. The hagfish is a true monster of the deep. To see why, one only has to examine its greusome feeding habits. A hagfish begins its feeding process by attaching itself to a passing fish. Once firmly attached, it then bores its way inside its unsuspecting host. Once inside, the hagfish will actually eat the fish’s flesh with a specialized rasping tongue. It literally eats its victim from the inside out. When no large prey can be found, hagfish will feed on worms and other small invertebrates they find on the ocean floor. Hagfish have a very slow metabolism and can go for months without feeding. They can sometimes be a nuisance to fishermen because they can spoil an entire catch of deep sea fish before the catch can be hauled to the surface. One catch of fish can contain hundreds of hagfish. Very little is known about the reproductive habits of the hagfish. It has been observed that some hagfish species are actually hermaphroditic, which means that they are both male and female. Females will lay up to 30 tough, yolky eggs. These eggs tend to stick together due to velcro-like attachments on the ends. Hagfish are often found curled around their eggs, but it is not know if they actually take care of the eggs with any type of brooding behavior. Hagfish do not go through a larval stage like their cousins, the lampreys. The newly hatched young are nearly perfect miniatures of their parents. The are all born hermaphroditic, but will change to either male or female as they develop. That have the ability to change sexes from season to season. Since local populations of hagfish tend to be quite large, as many as 15,000, it is believed that they have a low mortality rate. The Atlantic hagfish is a deep-water fish. They can be found at depths of up to 5,600 feet (about 1,800 meters). They are known on both sides of the North Atlantic Ocean as far north as Norway. 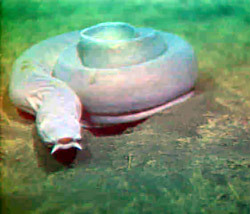 Hagfish prefer soft sea bottoms where they can quickly bury themselves when threatened.